He later married, but his destructive behaviors prevented him from being responsible for his family. He and his wife separated and he returned home to care for his ailing mother. When it became necessary to place her in a nursing home, he fell apart. “I felt I had lost the most important ladies in my life,” Allen shares. As his addiction and despair escalated, his life spiraled downhill, leaving him virtually homeless. “I knew if I stayed like this I was going to die,” he explains. 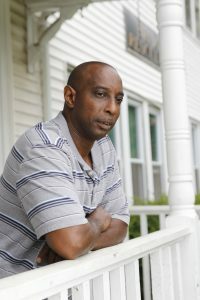 He called shelters and treatment facilities asking for help… until someone suggested Bridgeport Rescue Mission. Allen’s grateful for your gifts, which have given him and others this life-changing opportunity. “Without the people who give to the Mission, we wouldn’t have a second chance,” he says. He explains that your giving also allowed him, and allows program residents like him, to share those second chances with others while assisting with the Mission’s many outreaches.